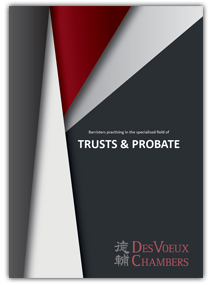 The chancery jurisdiction of the court covers matters such as trusts, land, probate and administration of estates. DVC has a strong presence in this area, as exemplified by the involvement of many of our members in the historic Nina Wang litigation. One of DVC's members is identified as a "very tenacious advocate with impeccable academic credentials whose clear and focussed presentation skills ensures she hits all the right points in a case." Another member stood out for being "obviously very sought after"...."seen in many high profile cases, with the ability to "come up with extremely persuasive arguments that no one else could think of and which could turn a bad case into a good one." One advocate specialising in probate and trust has been recognised for stand[ing] her ground" and for being "feisty and smart." A Silk stands out for being "extremely bright, very knowledgeable and user-friendly and easy to work with."